Item#-USA-2245B. Upmarket bed with a very stable frame. 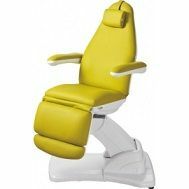 4 motors control height, backrest and seat inclination. Footrest adjustable with the 4th motor. 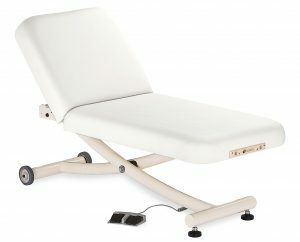 Also includes reversible arms and adjustable headrest. 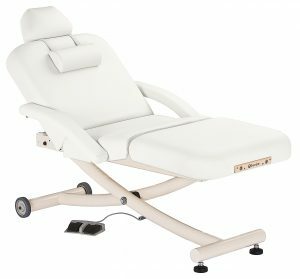 White PU seamless upholstery of high quality and easy cleaning.THIS STATIONARY ELECTRIC CHAIR MUST SHIP BY TRUCK ON PALLET SO THAT IT DOES NOT GET DAMAGED. THIS DOES NOT SHIP FED EX OR UPS GROUND. ALL SHIPPING CHARGES ARE EXTRA,THESE SHIP CHARGES WILL NOT APPEAR ON YOUR INTERNET ORDER BUT WILL APPEAR ON YOUR INVOICE RECEIVED FROM US.